On Monday, witnesses and human rights representatives told the council that blasphemy laws are being used as a weapon by Islamic fundamentalists against the Christian minority in the country. Perhaps Pakistan’s highest profile blasphemy case has been that of Asia Bibi, a Christian woman who was sentenced to death after being found guilty of blasphemy while working in the fields in 2009. In 2014, the Lahore High Court upheld the death sentence. UN officials also heard from another Pakistani Christian activist, Salma Bhatti, who spoke of systematic abuses suffered by young Christian women in Pakistan. “There are many young Christian girls in Pakistan who are being kidnapped and forcibly married,” she said, while adding that the women often disappear without a trace. Outside the UN office, a special screening of short films at Broken Chair this week underscored the plight of the Christian minority in Pakistan and Pakistan occupied Kashmir (PoK) as victims of Islamic extremism. 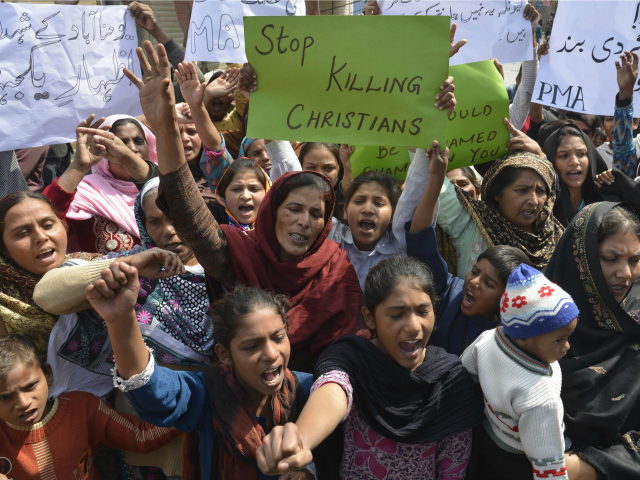 At only two to three percent of Pakistan’s total population, Christians are particularly vulnerable to persecution under Pakistan’s blasphemy laws, which date back to the military dictatorship of General Muhammad Zia ul Haq. In 1980, Pakistan’s Penal Code was amended to criminalize derogatory remarks against any Islamic personage, with a punishment of three years in prison. Two years later, a clause was added prescribing life imprisonment for willful desecration of the Quran and, in 1986, another clause was added to include blasphemy against the Prophet Mohammed as a crime punishable by death or life imprisonment. Last January, the U.S. State Department announced that it would finally add Pakistan to its Special Watch List for severe religious freedom violations, citing the egregious abuse of Christians, Hindus, Ahmadi Muslims, and other minorities in the country.